We had a lovely stay in Portland house for a birthday surprise for my husband. There were 20 of us spanning ages 15months to 70 yrs. The house was in an ideal location for 5 families to meet and catered very well for all of us. Large lounge and dining rooms and plenty of kindling for a real fire. Rooms very comfortable and a lovely secure garden. Just some concerns over the showers as some were cold if a few of you showering. Many thanks for such nice comments. We really appreciate it. We'd love you to visit again. Re the showers - it's when everyone showers an/'or takes baths within a same small period of time the tanks can struggle to cope and reheat - we haven't the capacity of Premier Inn I'm afraid. Stretching over a slightly longer period will usually sort it. We had an absolutely fantastic stay at Portland house and would not hesitate to come back in the future. The space was perfect for the size of our group and both Jenny and John were a great help. The hot tub was also a welcome surprise for my guests- it was such a treat being warm inside the tub and admiring the snow. Great house with plenty of bedrooms and space for 4 generations of our family to all get together. Very clean and great communication with owners. Lovely shop/deli and curry house house on doorstep and plenty of things to do close by. Thank you very much for such a positive review. It means so much to all the team who look after the house and prepare it for our visitors. You were perfect guests too, we really appreciated the tidy and neat state of the house after your departure. Merry Xmas to you all. Come back soon! Dear Lydia Thank you so much for such an informative and lovely and generous review. We're just so pleased you had a lovely time and that Portland House met your needs and expectations. Do come again! Perfect accommodation for us, a party of 15 canoeing on the Wye River. 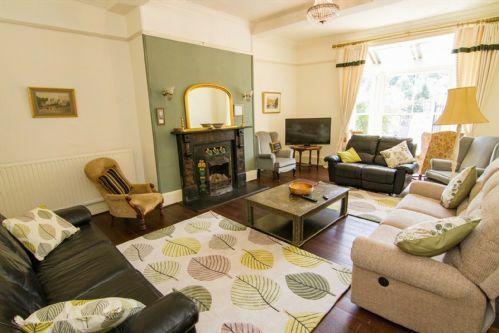 Well located, characterful house with stacks of room and good outside area for bbq's. We had loads of fun there and would happily recommend it. Ross on Wye Canoe hire were very good too! Fantastic for large groups - there were 17 of us for a hen do. We were able to hire a hot tub as an extra too. Hi Jen. Thanks so much for this lovely review. We always endeavour to do our best for our Hens! Beautiful house for a large gathering. This house is just perfect for a large gathering, we all loved it. Spacious rooms, comfortable beds, very well equipped, lovely enclosed garden, very clean and beautifully presented. A huge, delicious cake greeted us on arrival which was made by Jenny!! Thank you. We took a walk on the Saturday down to the river but didn’t explore much further as we all wanted to be at the house as it’s so lovely and to enjoy the garden which is fully enclosed (ideal for our dog) and a lovely area for us all to soak up the sun which shined the whole weekend!! All in all a great place to stay and we really hope to be back again soon!! We are so delighted that Portland House was such a pleasure for you all. The weather played its part as well. But the house does wrap its arms around you, I know! Thank for such a lovely review. We hope to see youa gain. Dear K. So glad you had such a great time, even with the sausages! (our private joke!). Thanks very much from all the team for your lovely review. Makes it so worth while when guests have shared their experience and really appreciated it. It was love at first sight when we entered the gates of Portland House! The place is huge and the bedrooms are incredible! We raced through the house like excited children, exploring the rooms and admiring the wonderful views. The kitchen is very well equipped with plenty of fridge space and everything you'd need to cook up a storm! The garden is beautiful and we were very lucky with the weather, eating most of our meals outside in the sun. The location is fantastic - a short walk to some lovely pubs and stunning riverside walks. We didn't want to leave and we'll definitely all be back when we get the opportunity! We hired Portland house for a hen do! We enjoyed a fantastic weekend, the facilities were good with a well equipped kitchen! Located near to symonds yat on the river wye- so we were spoilt for choice with activities! Most importantly John and Jenny’s communication was excellent from initial booking to our arrival! So pleased you enjoyed. Delighted to have you there. Hope you will return. Portland House is a wonderful large building,very spacious inside with plenty of eating space aswell as lots of relaxation space to just sit and chill. A very large kitchen that has all your needs,microwaves,washing machine/dryer,cutlery,ovens etc. We had a large group of 19(12 adults 7 children) who had more than enough space. The bedrooms are all of a large size with storage,en-suites and Tv,s.The location is fantastic close to Ross-on-Wye and several other small towns.There,s plenty to keep you occupied around the area be it walking,entertaining children or just enjoying the scenery of the area.The property itself has a lovely large garden and the children enjoyed a fantastic Easter Egg Hunt in the big spacious grounds.Very neat and tidy property in good condition.On arrival we had a lovely welcome pack witch included a very yummy homemade cake.All in all its a fantastic building we had a brilliant time there and would not hesitate to go again. Wonderful that you had such a great time. Come back! We stayed at the house for a weekend in March 2018, with four other families. We had a really enjoyable weekend staying at the house. It was clean throughout, and the bedrooms were big enough for the adults and children to share. The bunk beds on the top floor were a real hit too!! Would definitely consider staying again! Had a wonderful weekend in Portland House with a group of friends celebrating a birthday. Everyone loved how the house absorbed so many people, and how the living room fitted us all. It was perfect for our group of adults as each bedroom had its own ensuite. It is a great location - easy for drivers coming late at night to find because it is well connected on main roads. We set out from the house for a lovely walk around the river and the nearby countryside is gorgeous. The house had everything we needed to cook for a large number of people. It is really nice cooking in the kitchen with the Aga, and there additional oven & hobs meant it was very easy. A huge thank you to John and Jenny who were really helpful before and during our stay. I had to contact them a few times and they were very responsive and helpful. We had a very enjoyable weekend the house was perfect for us 16 people in total rooms very comfortable plenty of room throughout the house, The surrounding area very scenic and we enjoyed some lovely walks. I am happy to recommend to others and have mentioned to several friends. A beautiful house in a great location. We had a fantastic family weekend at Portland House, which is a well equipped, comfortable house, furnished to a high standard. The gently sloping garden is beautiful, with plenty of benches to use if you get the weather (we did!) and the hot tub hire worked a treat. Easy access to local attractions by foot, welcoming local pub (The Crown) and Woods of Whitchurch is a local shop to beat all others. We ordered breakfast pastries in advance and they did not disappoint! The cars we arrived in didn’t get used until we left on Monday morning! A great place to spend a celebratory weekend with family. Thank you. We enjoyed a comfortable stay at Portland House with 20 family members and hosted a fabulous 60th Birthday party on the Saturday evening. We had everything we needed in the kitchen for catering to our large group and loved the location being so close to Monmouth and in the lovely Wye valley. Would recommend to friends. The house was perfect for the Stag Do we organised and Jenny (owner) was so helpful with all the preparations. Will strongly consider returning next time we organise a big party! We all really enjoyed our stay. It's in a beautiful location. I highly recommend Portland House. Fab. Portland House is a perfect place for large groups and an ideal base for exploring the surrounding areas. As a party of nine children and seven adults we had plenty of room and the layout of the house and beautiful garden worked perfectly for us all. We thoroughly enjoyed our week's stay – the delicious cake on arrival was much appreciated! It's an ideal base for exploring the surrounding area and highly recommended. We really enjoyed our stay. We found the house clean and comfortable, with everything you could need. Only issue was toaster blew the fuse!!! The Hen really enjoyed herself. Lovely stay for stay for a group of 21 for my partners 30th birthday surprise weekend. John and Jenny had made us a beautiful cake on arrival and were very accommodating to any requests I had prior to the visit. Beautiful garden to accommodate us all and fabulous hot tub set up for our arrival. Surprising to read about he history of the house while we were there! Only down side was occasional cold showers in the higher rooms but John did warn us they had recently has trouble and would have been happy to have come and looked at them again for us, but it was only a minor inconvenience over a weekend. Also had to move all noise/music inside and to the right side of the house later in the evening due to neighbours but wasn't a problem. Thanks for having us and we hope to return!